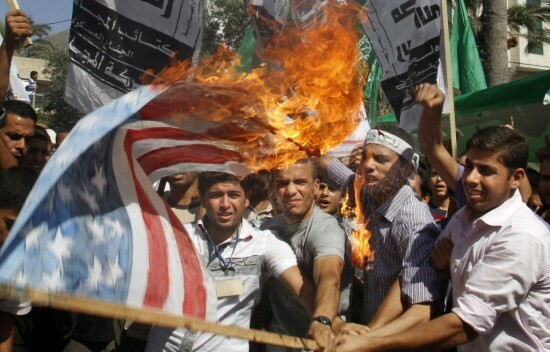 Gaza protesters show their gratitude to the United States. The Obama Administration will spend $300 million on construction projects in Gaza and the West Bank. Gaza is controlled by Hamas terrorists. Despite combined U.S. and international donor-community efforts, a significant portion of the public infrastructure currently under Palestinian Authority control remains in need of expansion or repair, according to the U.S. Agency for International Development, the USAID. Obama, through USAID, is stepping in to meet the need as a successful Palestinian state “depends upon an infrastructure system capable of providing basic services to a growing population,” the agency said in a Statement of Work released Sept. 24. The Local Construction Project, or LCP, on the other hand, explicitly forbids the transfer of funds to PA-owned or controlled entities – though it likewise mandates that subsequent awards are given to local contractors, thereby excluding the participation of U.S. vendors. Despite the prohibition against the awarding of contracts to government-affiliated firms, the PA indeed will directly benefit from the LCP.